Ghost of a Tale is being touted as a mainly one-man project, and a glance at the screenshots should underline just how staggering that is. This fully 3D title depicts a towering fortress full of perfectly-rendered and utterly adorable rodents, all lit with the most realistic dancing firelight one could ask for. A full day/night cycle even drapes it all in a constantly-changing color palette. I wouldn’t quite say that this is triple-A quality, but it ain’t far behind. As it turns out, Lionel Gallat – going by the moniker “SeithCG” – is a veteran animator, having worked on films by DreamWorks and Universal. So, building vivid virtual worlds is just another day in the office for this guy. 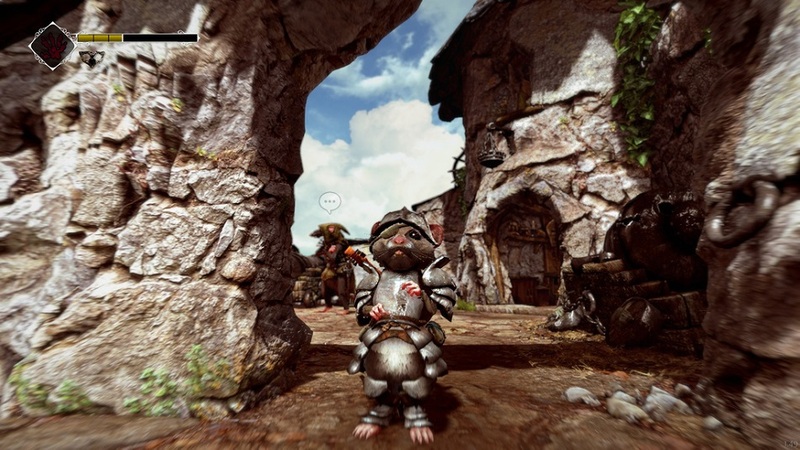 But Gallat is thus far untested in the field of game design, and while Ghost of a Tale displays a general lack of polish that often gives away his amateur status, his work here remains extremely promising. He draws influence from the right places, while strong writing and a terrific visual style give this debut release a flavor of its own. The setting should be instantly familiar to Redwall fans, in that it’s a low fantasy universe occupied by anthropomorphic animals. The rats are the oppressors, and the game begins with Tilo, a mouse minstrel, imprisoned for “acts of sedition” at a fortress called Dwindling Heights. Since mice are expert thieves, Tilo must escape from his cell, sneak about the fortress, and gather clues pertaining to his wife, from whom he’s been separated. The entire campaign is set in and around Dwindling Heights, and the place is rather sprawling — it includes multiple watchtowers, a harbor, and some sewers and catacombs down below. Since little Tilo can’t engage any of the armed guards directly, the emphasis is on avoiding combat altogether. The stealth mechanics are pretty rudimentary, a simple matter of memorizing patrol routes and staying out of line of sight. It’s also quite forgiving, which was the right choice in an action/adventure game with as much backtracking as this one. In fact, one of Tilo’s earliest objectives is to find a small suit of armor and disguise himself as a guard, at which point stealth becomes almost completely optional (as long as players are willing to put up with slow movement speed while he’s wearing it). The process of escaping the fortress then involves getting to know its inhabitants, exploring its most hazardous areas, and digging into its rich mythology. The lore is pretty expansive. Although we never see the world beyond Dwindling Heights, there are constant references to major historical events, important figures, and distant locations, all of which lend Ghost of a Tale the sense that this world existed long before we got here and will continue to exist after we leave. In one of the most ingenious moves, whenever an important piece of lore is brought up, players have the option to open a footnote explaining it in greater detail. None of it is required reading, but a little flavor text goes a long way. Additionally, the dialogue itself juggles humor and drama expertly, acknowledging the silliness of a fantasy world inhabited by rodents, but also not using said silliness as an excuse to forgo genuine weight. Every character who aids Tilo has a solid motivation for doing so, and SeithCG even avoids the temptation of making the red-eyed rats one-dimensionally evil when it comes time to converse with them. They’re unquestionably the villains, but when they believe Tilo to be one of them, they come across as actual people more concerned with what’s for dinner than with oppressing minorities. Ghost of a Tale’s only flub in the story department is that its ending can barely even be called one. When Tilo finally gets a more substantial objective than “escape the fortress,” the credits roll. None of the character arcs get satisfying conclusions, and the game has just introduced a major new threat right before the curtains fall. I’m fine with sequel hooks, but there needs to be some sort of climax and falling action for this to feel like a complete story. Ghost of a Tale seems to be missing its entire third act. In fact, as much as I enjoyed it, the biggest issue with Ghost of a Tale is that it doesn’t feel finished. There’s the abrupt ending with all of its dangling plot threads, but then there are also the technical shortcuts which expose how few people were actually involved with this project. The levels are full of artifacts and little gaps in the geometry, and many of the sound effects are outright missing. A major action sequence at the end involves a bunch of characters battling with swords, and the fight has zero accompanying sound effects. After five years, I get that SeithCG was eager to finally release this thing, but it still feels like it needed more time. My only other complaint is that the game is very heavy on fetch quests. Although Dwindling Heights is an impressively detailed play space – each room is full of its own little secrets – Ghost of a Tale still doesn’t cover a lot of surface area, and the errands players are asked to run for various NPCs feel like an attempt to pad the game’s length. Granted, the consistently charming dialogue always sold it for me, but I can imagine some players running out of patience. 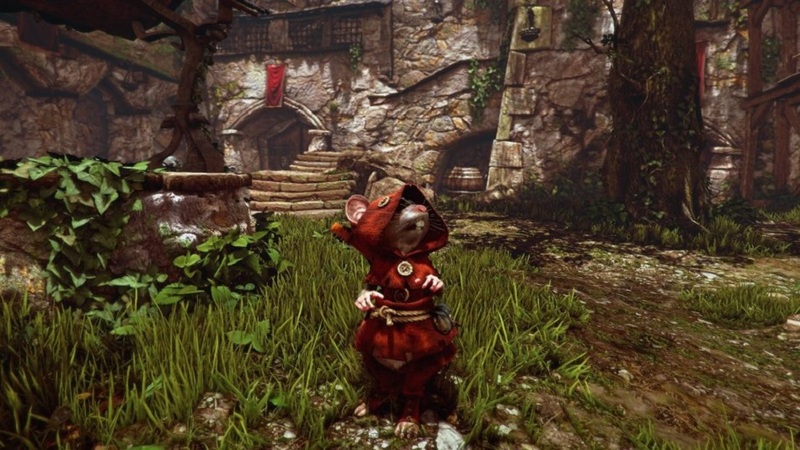 While there’s no question that the game has issues, what kept me interested was the bizarre and ambitious blend of stealth, exploration, and good old-fashioned role-playing — a mix that makes Ghost of a Tale difficult to pin down to any particular genre. Dwindling Heights will likely be one of my favorite settings of the year, both for its beauty and the way SeithCG forces players to familiarize themselves with its layout and schedule. I played this game expecting a simple level-based stealth romp, and got something so much grander and deeper. Disclosures: This game is developed and published by SeithCG. It is currently available on PC. This copy of the game was obtained via paid download and reviewed on the PC. Approximately 16 hours of play were devoted to the single-player mode, and the game was completed. There are no multiplayer modes. Parents: According to the ESRB, this game is rated Teen and contains Violence, Mild Blood, Mild Language and Crude Humor. It’s a pretty tame game, as the aesthetic is cutesy and the “blood” only ever manifests as little red clouds that appear whenever a character is struck. I didn’t notice any profanity. Oddly, the descriptors make no mention of alcohol use, of which there is plenty. Deaf & Hard of Hearing Gamers: It’s a stealth game, so being able to hear guards walking around will definitely make things easier. That said, a visual indicator pops up whenever the player is in danger of being seen, and the stealth itself is quite forgiving, so it’s still relatively accessible. Dialogue is strictly text-based.